I know, I know, it is after Labor Day and all things wearably white should be retired according to fashion etiquette. 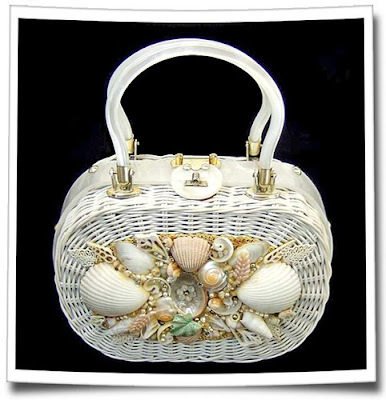 However, I just couldn't resist this terrific photo of a summer purse decorated with mostly white sea shells. Pretty little pearlized handles with natural sea shells and coral, this is such a sweet little vintage purse that I find purely joyful. 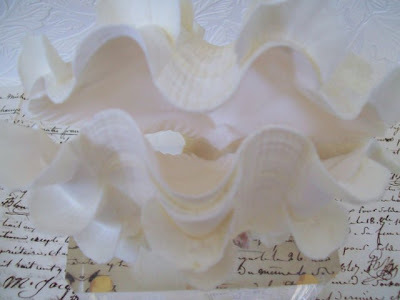 Decorated with assorted size cockle shells, spiral snail shells, tiny pieces of fan coral, a few sliced periwinkles, lots of faux pearls and let's not forget the plastic mint green leaf glued to it. Not sure what the decorating thought was behind that touch but it is in keeping with "bags my grandmother living in Florida would carry." hahahahaha. When you look at the wicker purse, it really is an easy item to decorate and now I'm wondering if I should be looking for these wicker purses at yard sales and Goodwill's to decorate myself. I have tons of shells (you would expect nothing less from a Sea Witch) and would enjoy embellishing these bags over the winter season for summer sale. I think I may have just talked myself into yet another project. I have really been enjoying my new booth space at Queen of Hearts in Buford. I have always been in small, more intimate shops, usually no more than 20-50 dealers. I like the friendships one acquires in smaller shops and the hometown feel you have with your customers. Queen of Hearts is a huge antique mall with three times that many dealers. I was afraid I would be lost in the mix of so many dealers, but to my delight, this has not been the case. I am now on my 4th week there and have sold well. Spent this past Saturday replenishing my space and adding items for Halloween. Not alot yet, just a nice mix of items to jump start the October season. Slowly adding more and more inventory. I'm still looking for a pair of old doors to make a door display and I would love to find a chippy fireplace mantle for the wall. Need to bring in a glass case for items that need to be locked up. My repurposed plastic frame with the Victorian witch sits nicely on the old trunk. I embellished recycled jean jackets with vintage laces, ribbons, beads and quilt blocks of vintage photos for Halloween. Darling vintage Japanese paper parasol. Lovely colors and in wonderful condition. World War 2 era. A touch of Halloween. I made a slew of these book displays from horror novels, vintage candlesticks, added faux blood, and other interesting items to decorate for Halloween. Only have a few left that I could sell this year. Time for another trip to Goodwill and their book section. So, it was a late, Sunday afternoon made perfect for getting around to doing a touch up (cover up) of my white and gray hair. I'm a natural blonde with chlorine/sun bleached hair from all of my pool/ocean time so about every 4 months I will do a honey blonde recolor to cover the faster then ever incoming grey and soften the harsh bleached tone the water does to my hair. Have been doing this for years now since the first grey hairs started to appear, what could possibly go wrong? Picked up a box of my favorite Loreal, cool ash blonde color for the cooler months since my summer tan is disappearing. Again, no change here other than the process. I purchased their "Excellence to Go," 10 minute recolor that is supposed to be less harsh than their other products. 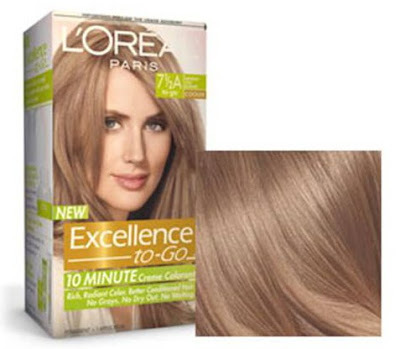 Color number was identical to what I have purchased from Loreal for this color tone and I have always liked the results. So, what do you do on a Sunday evening at 5:20 pm to try and fix this? I googled like crazy different solutions and then ran to my local Sally Beauty Supply (the women inside are hair goddesses) and they hooked me up with Color Zap. This gently removed all of the newly applied color and lucky me, returned my hair to a nice golden blonde. I may not seem busy, but I have a million things to do. As I look at this list I realize how blessed I am to have such a rich and full and somewhat out of control life. the silk ribbons are here!!! Patricia Winter of Pat Winter Gatherings blog posted that she was getting ready to hand dye silk ribbons. 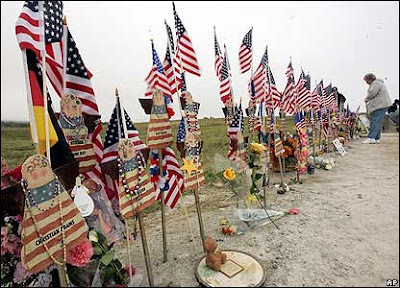 You can catch that posting at this link http://gatherings100.blogspot.com/2009/09/catching-upso-much-to-share.html. I use silk ribbons in my jewelry and after seeing the lovely, multi color strands on her blog posting I had to order immediately. So many glorious colors to choose from it was hard choosing but I had to narrow my choices to colors that I use most often with my beadwork. If I were "queen" I would have a strand of every color she offers. LOL. I ordered black, lilac, aqua, and turquoise and Pat even included some free ribbons as well. I love a freebie or "blog swag" ... thank you Pat. How luscious are these colors? I can't wait to utilize them in my beadwork and jewelry. 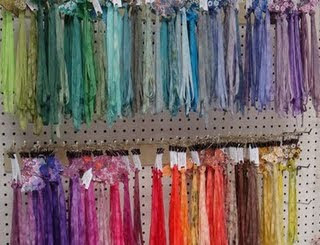 Pat, you dye beautiful ribbons and I will be ordering again soon. 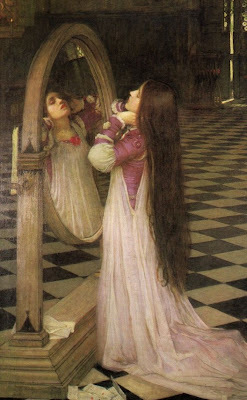 I have been looking online at the work of one of my favorite artists, John William Waterhouse. His paintings take me to wonderful and often mythical places. 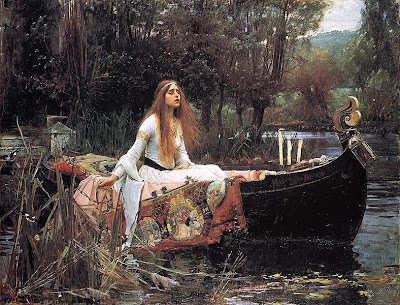 You are probably familiar with many of his works, " The Lady of Shalott" being one of his most famous. The Lady of Shalott - The detail in this painting is incredible from her rich tapestry, long flowing hair and the bull rushes nearby. Extraordinary! 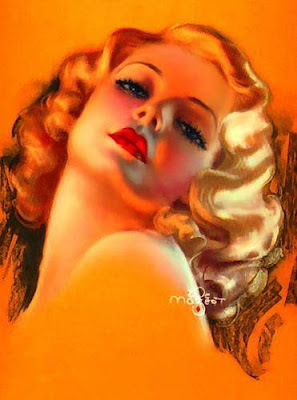 Mr. Waterhouse's work is breathtaking in its execution, detail and his passion for the feminine form. 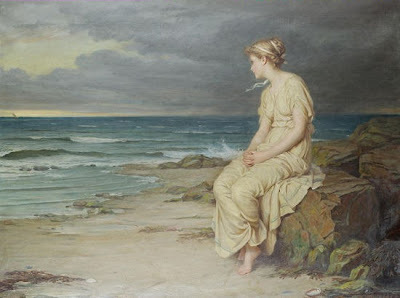 Waterhouse was born in the city of Rome to British painters in 1849. 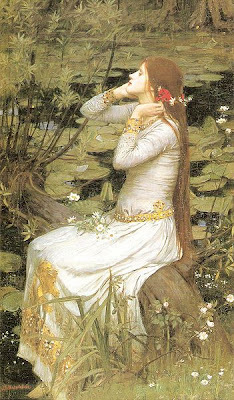 Ophelia - Another of Waterhouse's favorite subjects; the most famous of his paintings of Ophelia depicts her just before her death, putting flowers in her hair as she sits on a tree branch leaning over a lake. 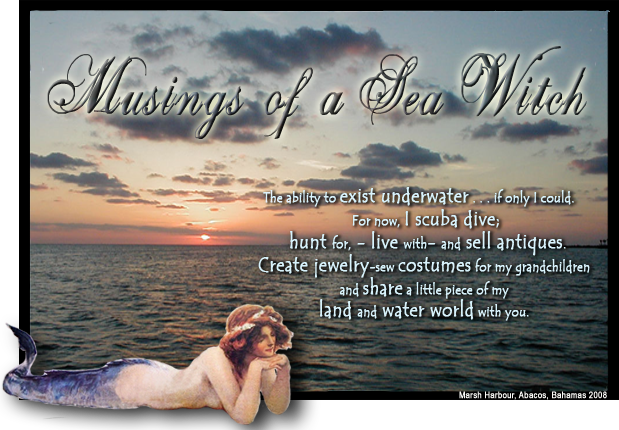 Miranda - What is this lovely woman thinking as she looks out across the sea? A sailor she waits for, contemplating her life, or just enjoying the sounds from the crashing waves. When I look at this painting I know this woman's spirit. 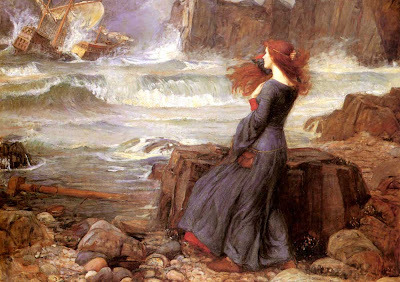 Miranda The Tempest - another favorite of mine, this women looks like she could tame the oncoming storm. 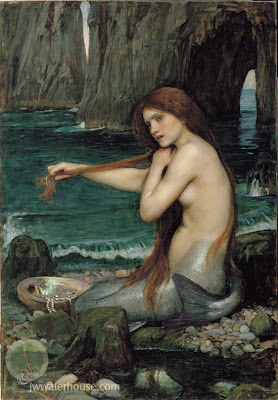 Of course, my favorite painting by Waterhouse is "A Mermaid." In order to receive his diploma from the Royal Academy, he had to submit a painting. 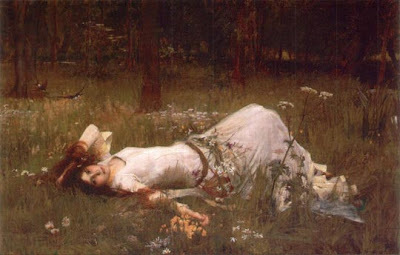 He submitted his Ophelia painting of 1888 but had originally wanted to submit a painting titled "A Mermaid", but it was not completed in time. After this, the painting was lost until the 20th century, and is now displayed in the collection of Lord Andrew Lloyd-Webber (Phantom of the Opera, Jesus Christ Superstar fame among many others). 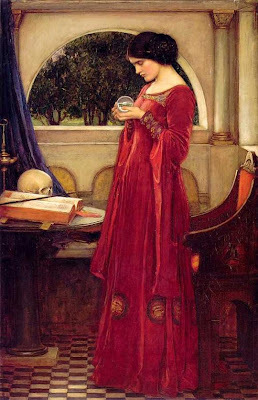 Very little is known of Waterhouse's private life - only a few letters have survived and thus, for many years, the identity of his models has been a mystery. 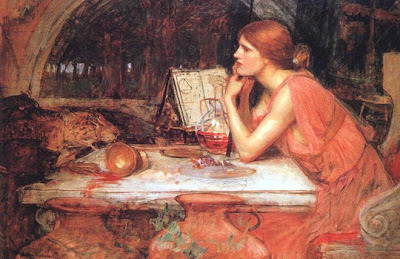 Waterhouse passed away in 1917 after a long bout with cancer. Fall is definitely here and it spilled over to my header. I just felt the need for a change and autumn leaf colors so I pulled one of the first underwater photos I had ever taken. 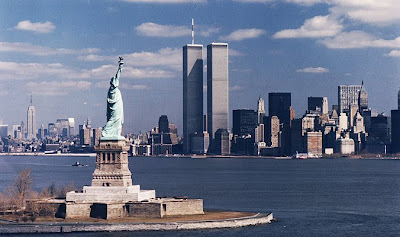 This was with my dad's old Nikonos film camera from the 1980s. One of the first point and shoots for snorkelers and was touted for its ability to withstand 15 feet of compression. This photo was actually shot at 25 feet under the sea at a reef in the Bahamas called the "Aquarium". You are looking at a shot of elkhorn or stag horn coral with a Parrotfish going through its mottled stage - hence the rich red and checkered looking body along with Sargent Majors (vertical striped fish) and French Grunts (yellow with fine horizontal striping). This reef was rich in sea life and I came away with some really colorful photos. This "White Shell Wednesday" posting is about the largest mollusk on earth, the giant clam and a shell I would love to own one day. 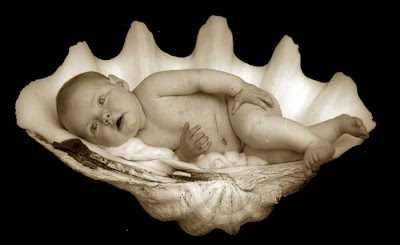 The definitive shell for a mermaid, she can find so many uses for such a spectacular shell. This mollusk gets only one chance to find a nice home. Once it fastens itself to a spot on a reef, there it sits for the rest of its life. These bottom-dwelling behemoths are the largest mollusks on Earth, capable of reaching 4 feet in length and weighing more than 500 pounds. They live in the warm waters of the South Pacific and Indian oceans. Giant clams achieve their enormous proportions by consuming the sugars and proteins produced by the billions of algae that live in their tissues. In exchange, they offer the algae a safe home and regular access to sunlight for photosynthesis, basking by day below the water's surface with their fluted shells open and their multi-colored mantles exposed. The white shells house the animal and like a snowflake, the mantle of this mollusk is different in each animal and are extraordinary in their color palettes. 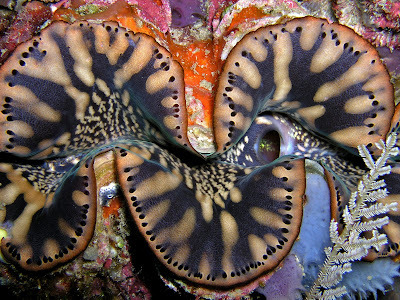 Giant clams have a wildly undeserved reputation as man-eaters, with South Pacific legends describing clams that lie in wait to trap unsuspecting swimmers or swallow them whole. 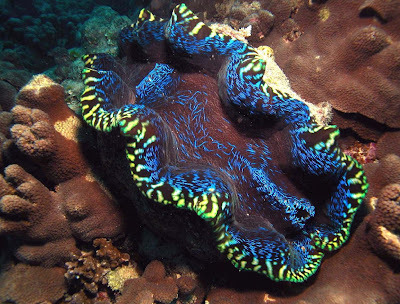 No account of a human death by giant clam has ever been substantiated, and scientists say its adductor muscles, used to close the shell, move far too slowly to take a swimmer by surprise. Even the largest specimen would simply retreat into its shell rather than attempt to sample human swimming by. 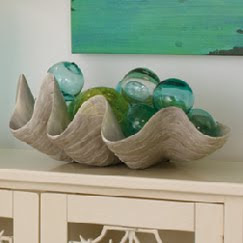 These marvelous shells have many decorative uses for display of favorite objects or converted to bath or wet bar sinks. 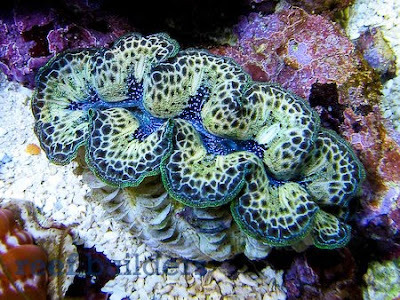 One of my favorite blogs, French Blue, http://frenchblue-frenchblue.blogspot.com/ showcases on their header (and sells) the scaly ruffled giant clam. 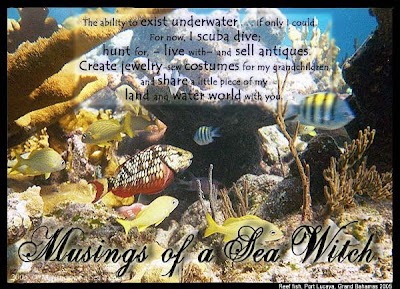 Exquisite items for sale and if you have not visited this wonderful site, please do. You won't be disappointed. Or rather Elvis is in my sister's kitchen. Sis wanted to replace her existing blinds with cafe curtains for the window over her kitchen sink. She also wanted to retain her privacy but allow light into the kitchen. So she asked if I would help her pick out a retro fabric and show her how to make cafe curtains. So we took off for local fabric stores. Looked at several different retro designs but nothing seemed to say, "Take me home." But then, a bolt of cloth in a shade of 1950's diner aqua beckoned her over. Could it be, yes the perfect fabric for a retro kitchen. Photos of Elvis from the 1950's. How fun is this cotton fabric for kitchen cafe curtains! So, out comes the sewing machine and the ironing board. Sis follows my instructions for cafe curtains and in a few hours, she has slipped the golden cafe rings onto the fabric and slid the rings on to her extension rod and has hung her new Elvis curtains. These will also go well with the Elvis candy tins I give her every Christmas. Great job, sis. Elvis would be proud and asks that you fry him up a peanut butter sandwich. Now while Elvis was being hung in the kitchen, I was running errands and I came across this pack of Huskie puppies at a stop light. I couldn't resist their sweet faces so I chirped at them and they looked over at me and started to puppy howl. Sweet babies. Sometimes you can come across the neatest things at the most unusual places if you are open to looking around. "Grandma-ma, you know I have been dreaming of a Jasmine princess gown in pink and purple." With those words spoken by my sweet granddaughter, I headed out to my local fabrics store and purchased lilac satin crepe and pink and hologram chiffon along with beaded and sequined trims and giant faux rhinestones. She asked for a Jasmine princess gown in princess colors and as every little girl seems to know that princess colors are pink and purple, I had to comply. Jasmine is the Disney Arabian princess and I could not convince my granddaughter to let me make her a traditional harem outfit so I created a gown that did not have the usual gathered waist but rather an A-line silhouette with a flared bottom. I added "veils" to the front and back and lots of sparkly beads and big princess rhinestones. Her crown and veil can be worn two ways. She can wear the veils in the back with the large rhinestone in the middle of her forehead...just like Princess Jasmine. Or, she can put the veils in the front if she must be mysterious. So I have packed this and addressed it to Italy and have let Kit Kat know that her gown is on the way. I can't wait to see my sweet girl in her new gown. Kaitlyn with her new sister and brother. She is a good big sister! 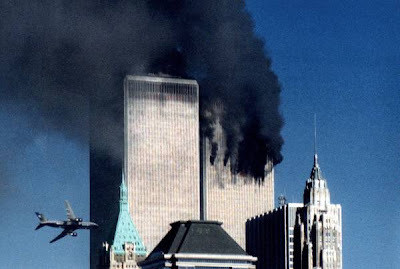 On September 11, 2,752 men, women and children fell victim to the second terrorist attack on the World Trade Center. 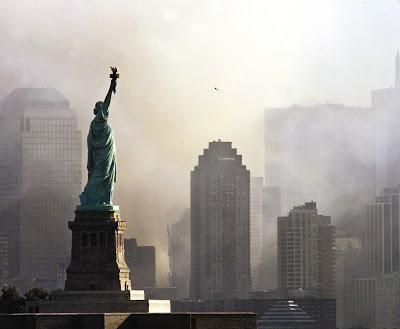 September 11, 2001: "Today: Less humid. Sunshine. High 79." Polls open in New York City for primary elections. 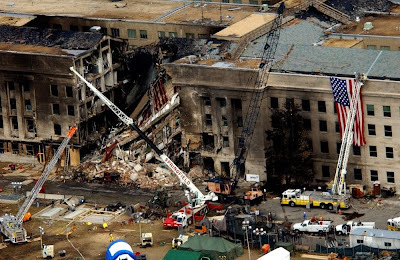 President George W. Bush addresses the nation, saying: “Today, our nation saw … the very worst of human nature. 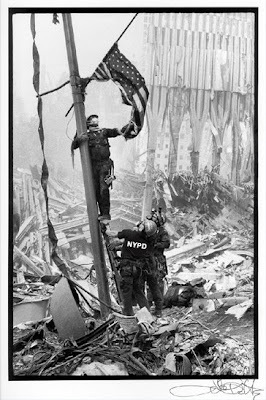 And we responded with the best of America—with the daring of our rescue workers, with the caring for strangers and neighbors who came to give blood and help in any way they could.”All told, 2,975 men, women and children fell victim to the second terrorist attack on the World Trade Center and the terrorist attacks in Pennsylvania and Virginia. Wanted to finish up our road trip this week and get it posted. On Sunday we drove through the beautiful Smoky Mountains and into the Blue Ridge Mountains. A lovely ride that took us through vast scenic beauty. Incredible blue mountains all framed by wild flowers from the road, I could have stopped at every overlook and snapped pictures. Overlook Ridge around 10:00 am. Still sleepy looking with muted pine green shades. Why it is called the Smoky Mountains. The precipitation remains stationary in the range and the rain clouds hang like smoke. By noon, the sun was up and the mountains began to take on the rich blue color as we entered the Blue Ridge Mountains. Wild flowers grow all along the side of the overlook areas. I love the contrasts of the yellow against the blue mountains and sky. Wild mountain flowers against the Blue Ridge Mountains and sky. I noticed this stone stairway leading up to a trail while returning to the car from another photo session. Has such a middle earth quality about it. Yes, a yard sale at the base of the mountains. Now you are talkin. Found a few treasures that will go into the shop this weekend. On Monday, we continued our trip on state roads rather than the Interstate and drove through the little town of Ellijay. 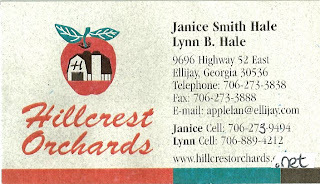 My honey say the sign for Hillcrest Orchards and we pulled in. As a hunter from up north, he romances the fall season by sharing how he loved to stop for fresh pressed apple cider, fresh picked apples from the tree and of course, hot cider donuts. Hillcrest Orchards did not disappoint...in fact they must be very well known as their parking lot was filled with folks coming and going...all carrying out big bags of apples. We grabbed a big bag and filled it to capacity with Golden Delicious, Red Delicious and my favorite, Granny Smith. Their sign says, no half filled bags...they want you to squeeze as many as you can in your bag to take home and enjoy. Filled a smaller bag of Granny Smith for my sister as well. We went to the sample table to taste some of the harvest. There is nothing like freshly picked fruit off the tree. So rich in flavor. This little guy welcome you as you entered the store. My honey grabbed a bag of freshly made hot cider donuts covered in sugar. They looked and smelled heavenly. I'm not a sugar eater so I asked the woman at the counter if they had donuts without the sugar coating. She went in the back and brought me out a bag of "hot, out of the fat" donuts in a white bag. I thought I had died and gone to donut serving heaven. Had to take a picture of the white bag with the translucent look of the donut showing through. Only thing missing was a cold glass of milk but that did not stop me from eating two of them as we headed down the road towards home.